Easily shreds a variety of media. Dedicated feed slot for credit cards and discs. 360° swivel casters and a front-pull wastebin. 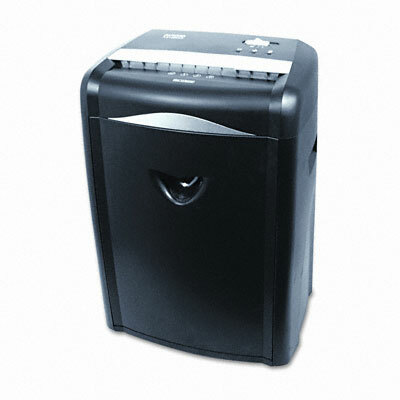 This medium-duty shredder is ideal for the home or home office. Easily shreds a variety of media, including staples and paper clips. The durable steel cutters are designed for minimal jamming. Dedicated feed slot allows safe feeding of credit cards and disc. Provides warning detection to prevent unit from overheating. Features 360° swivel casters and a front-pull wastebin for quick emptying. Large capacity collection bucket keeps you shredding longer between empties. Rugged construction ensures smooth operation over the lifetime of the machine.